Yamaha continues to offer incredible musical technology and innovation with the new Yamaha PSR S970 arranger workstation keyboard. The Yamaha PSR S970 workstation keyboard effectively blurs the line between digital and acoustic sound and the result will change your musical perceptions forever. Yamaha have recorded professional musicians to achieve authentic renditions of their instruments and playing nuances and now you can play alongside them. The PSRS970`s other incredible features include Vocal Harmony 2 and Super Articulation for thrilling instrumental and vocal support. It will add a whole new perspective to your creativity. The sound is amazing ! Acoustic instrument articulations, nuances and dynamics are challenging to reproduce. As the worlds largest musical instrument manufacturer, Yamaha has perfected both the science and art of this process to bring you the most sophisticated, musical-sounding and easy-to-play instrument Voices. Super Articulation voices reproduce the performance characteristics of acoustic instruments so authentically, you`ll feel as if you`re playing the real thing. Best of all, SA voices intelligently add the right expressive nuances to your performance without having to learn complicated control techniques - just play! 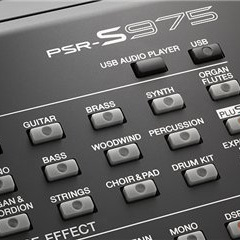 The PSR-S970 features two assignable live controllers, a modulation wheel and two assignable foot pedal inputs, ensuring that you have total control over voices, styles, effects and other functions during live performance. Also, DJ Styles are a new live performance concept, featuring a collection of chord progressions that eliminate the need for continuous chord changes with the left hand. Now youve got both hands free to play melody lines, use the Live Controllers, or even trigger additional external audio with the Multi Pads to add a unique flair to your performance. The PSR-S970 has Yamahas Virtual Circuitry Modeling (VCM) technology that simulates the effects of phaser, Wah, compressors, and phasers at circuit level. Enjoy realistic Super Articulation Voices, Organ flutes and many other sounds from the legendary Tyros series. The PSR-S970s superb sonic quality, meticulously sampled voices, and a comprehensive suite of effects will take your performances to a new level of authenticity that is sure to satisfy even the most demanding audience. Yamaha PSR-S970 Keyboard Powerful Synth Vocoder and Vocal Harmony function. The PSR-S970 is equipped with a new Synth Vocoder function, which allows you to use your voice and synthesize with the PSR-S970s sound. The powerful Vocal Harmony 2 system allows you to control the pitch, level, and number of harmonies added, ensuring that your vocals are always the star of the show. First Impressions of the Yamaha PSR-S970. The widescreen effect is the first visual difference you notice , compared to the square screen of the S950 , the 7 inch TFT Widescreen of the S970 certainly looks sleeker , more modern , clearer and lesss cluttered than its predecessor. There are over 200 extra sounds on the S970 when compared to the S950, although obviously the quality rather than quantity of voices is more important , as a general rule the "SA" or "Super Articulation" are amongst the best voices , in this respect the S970 is well endowed with more than double the SA voices of its predecessor. Its not all about SA voices though there are some excellent new voices in all the other categories , such as 7 more mega voices , 4 more sweet , 10 more cool voices , 50 more live voices and 10 more organ flutes. 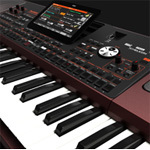 Previously only the Tyros models have the capacity to have a sensible amount of expansion , now with a built in 512mb of sample memory, customers will be able to purchase "tyros type " expansion packs from www.yamahamusicsoft.com . In addition you can also import third party samples such as those supplied by www.ttt-sounds.com.If anyone has any difficulty in downloading or using their packs all AC Hamilton customers benefit from friendly help and technical support from our affable technical whizz kid Mr Keith Rawlinson whose patience is limitless when coming to the aid of our customers. A big part of an authentic sound is the effects , the new VCM ( Virtual Circuit Modelling ) if you play guitar you know that it makes a huge difference what amplifier and effects you plug you're guitar into and put simply VCM means that you are getting the proper effect of an iconic amplifier, as used by famous guitarists from various decades going back to the 60's. The S970 now has the more advanced Vocal Harmony 2 System and a Synth Vocoder ( allows you to Synthesize your voice with an S970 sound ). This is an interesting one , the new DJ styles have a pre programmed chord progression, so your left hand isn't stuck to the keyboard, try it , its fun !.